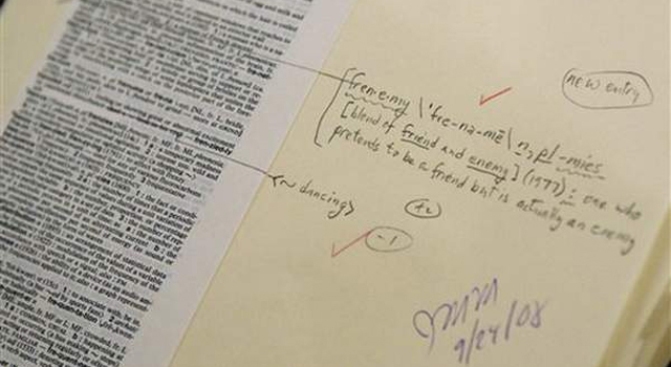 A working galley shows the progress of the word "frenemy," which was included in the most recent edition of the Collegiate Dictionary. Do you use a sock puppet to secretly keep track of your frenemies? Plan to spend your staycation watching vlogs and webisodes? Or perhaps you plan to signal a flash mob for a quick bite of shawarma. If you're not entirely certain what all that means, you might want to run out and buy the latest edition of the Merriam-Webster's Collegiate Dictionary, which has added about 100 new words that largely reflect changing trends in American society. And if you don't like what you see in your new dictionary blame Yelp, Facebook, YouTube and Twitter. John Morse, president and publisher of the Springfield-based dictionary publisher, said many of this year's new words are tied to changes in technology, increasing environmental awareness and aging baby boomers' concerns about their health and have become part of the general lexicon. "These are not new words in the language, by any means," Morse said. "(But) when words like 'neuroprotective' and 'cardioprotective' show up in the Collegiate, it's because we've made the judgment that these are not just words used by specialists. ... These really are words now likely to show up in The New York Times, in The Wall Street Journal." There are words such as locavore (one who eats foods grown locally), frenemy (someone who acts like a friend but is really an enemy), waterboarding (an interrogation technique use to induce the sensation of drowning), vlogs (a blog that contains video material) and webisode (a TV show that can be viewed at a Web site). There's also flash mob (a group of people summoned electronically to a designated spot at a specified time to perform an indicated action before dispersing) and green-collar (involving actions for protecting the natural environment). Some words that just now made the cut have been around for generations. The term "sock puppet" — a false online identity used for deceptive purposes — was tracked to 1959 but has taken on new popular use with people using fake IDs on social networking sites. Many words have cross-cultural roots, including shawarma (a sandwich especially of sliced lamb or chicken, vegetables, and often tahini wrapped in pita bread) and reggaeton (music of Puerto Rican origin that combines rap and Caribbean rhythms). Once words like these become so common that they regularly pop up in conversations and published articles, Morse said they pass muster for being included in the dictionary. Some words, such as "staycation," have become so popular the dictionary could not ignore them, Morse said. Staycation refers to staying home for vacation and has gained popularity as the economy worsens. But Morse said some words face years in limbo as wordsmiths wait to see if they are just fads. Dave Wilton, author of "Word Myths: Debunking Linguistic Urban Legends," said it's difficult to draw conclusions about trends in society with just a handful of new words. "It's also an editorial decision and reflects what the (dictionary) editors deemed important that year," Wilton said. "Most of these words have been around for a while but for some reason they grabbed the attention of editors this time." Researchers often keep track of words over many years. One to watch: prepone. The word is commonly used in India among English-speaking Indians and refers to the act of arranging for an event to take place earlier than originally planned — the opposite of postpone. "Prepone didn't make it this time," Morse said. "But we know about it."